Hi, I am interested in your 1992 Buick Roadmaster (stock #5108-CHA) listed on Autotrader for $11,995. I'd like to get more information about this vehicle and confirm its availability. 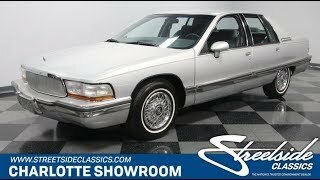 If youre a lover of classic-style American luxury, then this 1992 Buick Roadmaster should have you quite excited. Highly original, exceptionally maintained, and absolutely plush, this is the loaded cruiser offered for an affordable price. This is the last of the big American luxury cars... this is the last generation Roadmaster. Like the name sounds, this one is meant to own the asphalt. But while its substantial in size, it also has a graceful look with a gently sloping hood, dual color pinstripes, and wraparound taillights. This is finished in its original Silver Metallic, and the way it continues to pop in the sunshine lets you know this luxury sedan was treated with care all its life. Against this bright silver is additional shining thanks to classic American style brightwork that includes the distinct grille, factory wire wheel covers, and a bright trim line that encircles the entire body. While the exterior is nicely preserved, its the interior youre really going to love. These are known for their space to really let everyone spread out, and with such a quality condition, this Roadmaster continues to provide true luxury. Its not just that you have plush velour and a ton of legroom, but also Buick really understood the details. For example, the rear seat has individual bolstering and a fold-down armrest, so you can really offer two people true individual lavishness. Up front is the same kind of personal luxury, and the seats even power adjust to your ideal position. Youve got a ton more features, including power windows, power locks, key-less entry, power mirrors, full instrumentation, and automatic climate control. If this is starting to sound like a great modern classic, then youll also be excited about modern safety features like a driver airbag and anti-lock brakes. Its a great road-tripping Roadmaster, and so the trunk swallows luggage, golf clubs, and just about anything else youd want to take with you. Under the hood is more of that well-preserved look seen throughout the car, so it should be no surprise that this is believed to be the original motor. Its a fuel-injected 5.7-liter engine, which means plenty of power whenever you need it, but the kind of quiet operation you expect from a car built to this degree of comfort. And speaking of comfort the Dynaride suspension with leveling shocks gives this the feeling of floating down the road. Plus, the power steering, cruise control, front disc brakes, and four-speed automatic transmission with a highway-ready overdrive are all perfect for the long haul. Complete with owners manual, this is a modern classic made from one of Buicks best pedigrees. So if your dream is to feel like driving on a cloud, dont miss this Roadmaster. Call now!